This forecast was published 04/11/2019 at 6:59 AM. This is an archived avalanche forecast and expired on 04/11/2019 at midnight. Temperatures have continued to fall since yesterday resulting in a sketchy mix of wind scoured, bulletproof ice crust and fresh wind slabs. 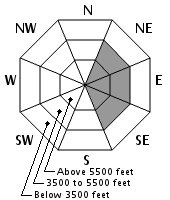 Areas that contain these wind slabs have MODERATE avalanche danger due to the possibility of a human triggered avalanche. Steep terrain without well-bonded new snow will have a significant sliding fall hazard. Don’t count on arresting a fall on the icy surface beneath this new snow. Even a small avalanche can cause a significant problem today. A brief window of sunshine and warm temperatures may bring some softening this afternoon but consider your options if it does not. And bear in mind that the new wind slabs will weaken if and when they warm today. Snow showers continued yesterday and overnight, depositing another inch of snow at higher elevations for a 48 hour total of 3”. During that time, WNW and NW winds continued to transport snow on 45-60 mph winds. Skies have cleared today after two days of fog. Wind will diminish as well, possibly all the way down to 15-20 mph by afternoon. The current temperature on the summit is 5F with 13F at Hermit Lake. The forecast high temperature for the summit is 23F. Warming will continue overnight and tomorrow as southwest flow brings rain by tomorrow night. True to form, the expansive fetch of the Bigelow Lawn and Alpine Garden produced ample amounts of snow to build wind slabs out of a paltry amount of snow. Forty eight hours of W and NW winds efficiently moved this snow around the mountain and refreshed our still wintry snowpack. Limited visibility and active wind loading kept us out of steep start zones yesterday but the feedback we received while standing in boot-top drifts was sufficient to develop a wait-and-see opinion on skiing anything steep. The icy bed surface from Monday’s sleet, snow and freezing rain mix was well on it’s way to a deep solid freeze with -7C on the surface gradually warming to 0C down 15cm. At this point, it’s locked up tight. As temperatures warm, the new wind slabs will weaken, ultimately passing through peak instability as a wet slab avalanche problem tomorrow before becoming a part of an isothermal snowpack. Recent snowpack and avalanche observations can be found here and on Instagram. Your observations help improve our forecast product. Please take a moment to submit a photo or two and a brief description of snow and avalanche information that you gather in the field. Posted 04/11/2019 at 6:59 AM.